Mixed pair Astra Sharma and John-Patrick Smith have completed an Aussie doubles trifecta, winning through to the Australian Open final. Sharma and Smith upset the second-seeded pairing of American Nicole Melichar and Brazilian Bruno Soares 6-4 7-6 (7-5) to reach their first major decider. The duo join Samantha Stosur and John Peers in flying the flag for the locals, each reaching doubles finals of their own this weekend. On Thursday night, Smith had even more reason to celebrate, triumphing on his 30th birthday. After finishing the semi-final at 11:20pm, Smith was eager to spend the final minutes of the day in traditional fashion. "Where are my beers? Who's got my beers?" he asked the crowd in his on-court interview. The larrikin Queenslander then backed down, citing the need for routine. "I got to play on RLA so a pretty good day in the books I would have thought," he beamed. Sharma, a 23-year-old Western Australian, and Smith, a veteran from Townsville, had limited knowledge of each other before pairing together this fortnight. They've clearly found a connection, defeating multiple-major winners Bethanie Mattek-Sands and Jamie Murray in the quarter final before Thursday night's triumph. As Smith acknowledged, Sharma was the star, continuing her fine form in singles at Melbourne Park. "Ash was carrying me. She's done really well and has been doing really well for me this tournament," he said. Sharma, the world No.232, qualified for her first major this month and won her first-round match to ensure a huge rankings drop. She can toast a first taste of grand-slam tennis with a final against Czech Barbora Krejcikova and American Rajeev Ram on Saturday; the country's national day. "It's all unreal," she said, "I actually can't think right now. "Going out to the court, you see all those lighted-up panels and it's intimidating. I was shaking in my boots. "I'm speechless really. I can't really believe the situation we're in. Coming into this I had zero expectation and now I'm absolutely over the moon." Their triumph means the final three days of the tournament will all feature Australians. Stosur won through to Friday's women's doubles final, where she'll team with Zhang Shuai against reigning champions Timea Babos and Kristina Mladenovic. 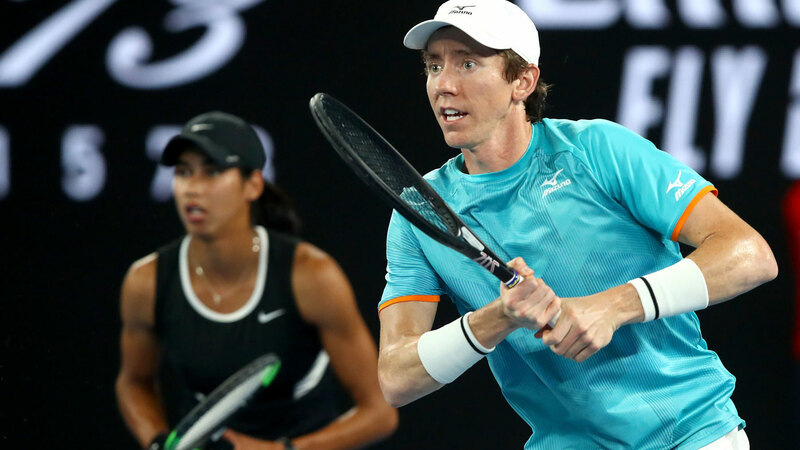 Peers, a 2017 Australian Open champion with current partner Henri Kontinen, face formidable French duo Pierre-Hugues Herbert and Nicolas Mahut on Sunday.